I recently wrote a review of Gene Luen Yang’s Boxers, and this book, Saints, is a companion piece. In fact, it’s more than just a companion piece — it’s a conclusion. In Boxers, there’s a moment where the main character, Bao, sees a young girl close to his own age. He believes she looks like the devil. Later on in the book, when they are both much older, Bao (seemingly) kills this girl in the city of Peking because she will not renounce her Christianity. Saints is the story of that girl, from the time she is eight up until the age of fifteen. She is simply called Four-Girl in the beginning by her family. She is unwanted, unappreciated, and largely neglected. It isn’t until she meets converts to Christianity that she begins to feel a sense of security. Eventually, Four-Girl converts as well and chooses the name Vibiana. However, throughout much of the book, and despite being visited frequently by Joan of Arc herself, Vibiana is not exactly the most devout of Christians. She likes the food. She likes the roof over her head. She likes being recognized as a human being and not a waste of space. It’s clear Jesus is not at the forefront of her mind. When she hears of the Boxers headed to kill Christians, she is inspired to follow Joan of Arc’s lead and fight in the name of God. But really … she just wants to fight. After the life she’s endured, can you blame her? She is eventually captured by Bao from Boxers, and at that moment you get to find out exactly what took place between them in that scene from the first book. While Boxers is quite a bit longer, the ending of Saints struck me as far more poignant. Admittedly, this could be because I consider myself a Christian as well. Vibiana (Four-Girl) undergoes a tremendous change, one that I won’t spoil for you, but one that absolutely resonated. As Boxers depicted Bao losing more and more of himself in his plight to save China, Saints offers a bittersweet story about Vibiana finding peace. That tranquility, however does not arrive as one would expect. Just the opposite. 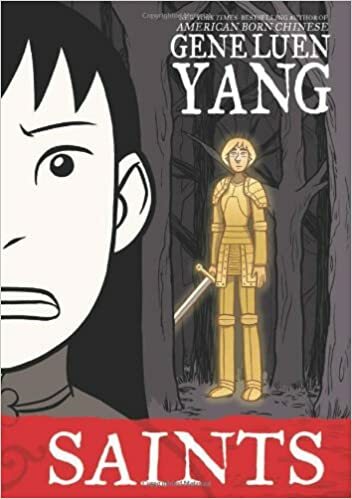 A noted Christian himself, I appreciated that Gene Luen Yang did not get too heavy-handed with Saints. In fact, like with Boxers, he made a point to show the good and bad in everyone. The Boxers consider themselves freedom fighters striving to preserve their culture, yet the Christian converts consider them monsters. The Christians in the book believe themselves to be righteous, yet many of them are self-serving and overtly sinful. However, in the end, Yang reminds us what it is to be truly selfless. Some would say that’s being Christ-like. Others would say it’s simply being compassionate. Though the artwork is simply rendered, this is a powerful story about history, people, motive, and belief. The epilogue of the book, by the way, shook me to my core. Perfect. This entry was posted in Book Reviews and tagged arts, books, comic books, entertainment, gene luen yang, graphic novels, review, saints.